ISO BOTH nights At Fenway! Have European shows for trade, or I’ll purchase anything I can get! Missed all deadlines for preregistration due to family sickness..
willing to Gift away Europe tickets for these shows! Our merry little band of travelers to PJ shows got shut out of Boston 1. No 10c, no verified fan, and no public sale today. All 7 of us are also doing Seattle, and Chicago, and one couple are going to Missoula. We all got 10c for the shows, but not one of us got Boston 1. I guess we will be sitting outside with lawn chairs, drinking beers. Unless anyone has 7 extra tickets they would like to sell. Will stand in line for you to get you the merch the day of the show and I will pay for one shirt and will pay you for the ticket. I actually need 2 tickets for me and a friend(had he not come with me, I would have traded my night 2 for night 1) ,but I would settle for one for the meantime. Looking for a pair of tix for Boston 1. Will trade for a pair of reserved, non-10C tix for Seattle night 1 or 2. Looking for 2 for Boston 1. Have 2 for Wrigley 1 available for trade. ISO pair Boston N2. Fortunately scored N1 thru Presale. Def. getting nervous about booking an Air B&B for Sept 2nd -5th without securing tickets for Boston Sept 4th show. ISO of Fenway N1. May be going to both Wrigley shows solo, so I would have 1 to trade or will pay for ticket. ISO one ticket for each Fenway show. Will pay face AND wait in line to get merch for you, so you don't have to. PM me if interested! Thanks! Anyone get shut out for Fenway Night 2 PJ Tix? I have a friend who has an opportunity with some tix available. It is part of Theo Epstein's charitable fundraiser event. Looking for night 2 for Fenway. 2 tickets but ONE ticket will do too! looking for 1 for fenway 1. may have a missoula GA to trade. thanks! Looking for 2 Fenway Night 1 (or maybe night 2). Please and Thanks! "The memories of a man in his old age are the deeds of a man in his prime" r.w. "Fearlessly the idiot faced the crowd-smiling" p.f. 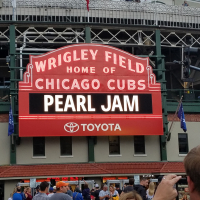 I have a Wrigley night 1 G/A, I want to trade it for Fenway night 1 (Low 10 club number ticket only). Please PM me thanks! Looking for one ticket to Boston Night 2...visiting Fenway has been on my bucket list forever, hoping to make my 40th show a very special one. Looking for 2 for Fenway night 1 for my first show with my future wife before we leave for our honeymoon!!! ISO one ticket for Night 1. I’m coming in solo from Chicago for this show. Please PM if anyone has one available. Beers on me. Thanks. Looking for 2 tickets anywhere for either shows in Boston. Night 2 is day before my 50th birthday! I have never had a birthday show that I have been able to go to. Please let me know if you can help me out! Looking for two tickets for the Sunday show at Fenway. Please help!